I'm in North Carolina this week, visiting the Great Smoky Mountains. They're called "smoky" because of the natural fog that often hangs over them. The mountains fade into the distance, with each ridge becoming a little more faint. On this day, we're driving across a section of the Blue Ridge Parkway. There are lookouts every mile or so, and we're checking out pretty much each and every one. Since we're driving along the ridge of this particular ountains, some of the views are to the right and some to the left. The weather adds to the beauty, as the conditions constantly change, from sun to fog and back again, and then some rain, with thunder and lightning thrown in to boot. 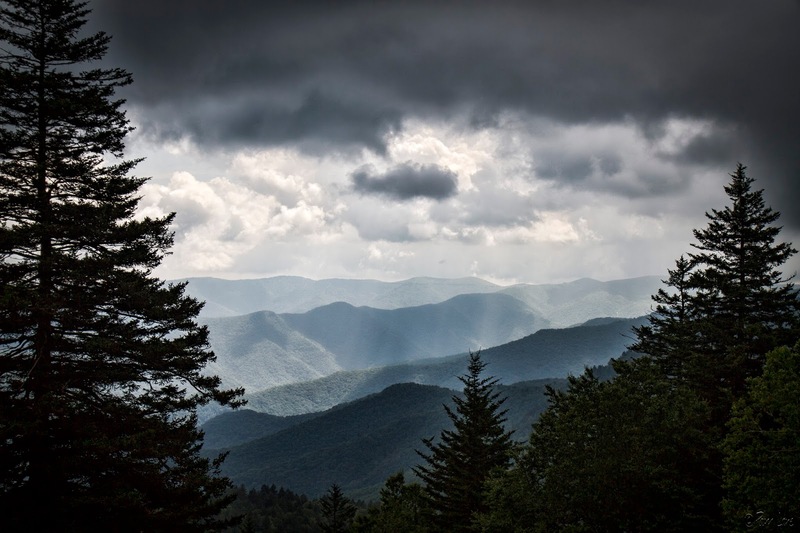 "If you drive to, say, Shenandoah National Park, or the Great Smoky Mountains, you'll get some appreciation for the scale and beauty of the outdoors. When you walk into it, then you see it in a completely different way. You discover it in a much slower, more majestic sort of way."